WritersCorps, a WITS Alliance organization in San Francisco, was thrilled to be a part of Litquake again this year, the annual literary festival that brings hundreds of writers and thousands of literature lovers to San Francisco for a fun-packed week of events. Our teaching artists and students read on Saturday, October 13, 2012, as part of Lit Crawl, the last hurrah of the Litquake fest for the year which features three hours of poetry, fiction, and non-fiction readings in bookstores, bars, art galleries, restaurants, stores, cafés, laundromats, and community spaces in SF’s Mission district. As an organization employing professional writers and teaching creative writing to underserved youth, it is important to us at WritersCorps to have a connection to the city’s literary scene, which is exactly why we participate in events like Litquake. A bit about us: we are a joint project of the San Francisco Public Library and the San Francisco Arts Commission and have helped nearly 18,000 youth from neighborhoods throughout San Francisco improve their literacy and increase their desire to learn. We publish award-winning publications, produce local and national events, and are part of a national alliance with sites in the Bronx and Washington, D.C. In 2010, we were honored with the National Arts and Humanities Youth Program Award from the White House, presented to us by First Lady Michelle Obama. At Lit Crawl, WritersCorps packed the house at gift shop Serendipity. Teaching artist Rose Tully read an excerpt from a short story in which Crisco played a starring role. harold terezón read a series of poems, including one made up of all the names he’s ever been called. Carrie Leilam Love, true to her name, read a series of love poems. Roseli Ilano read an excerpt from her story, “Treasure.” Minna Dubin read from a prose piece. 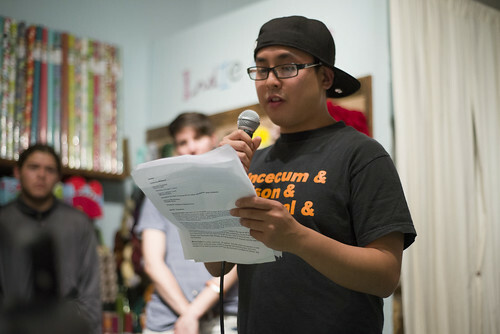 Anhvu Buchanan read a bromance ode to Jeremy Lin. Representing our students, Indiana Pehlivanova, Evelyn León, and Roger Lopez read from recent work. Though the entire reading was a success, a particular highlight was Evelyn reading a poem about her father and bringing him, and nearly everyone else present, to tears. To see all of the photos from the event, click here. To see all of the videos, click here. 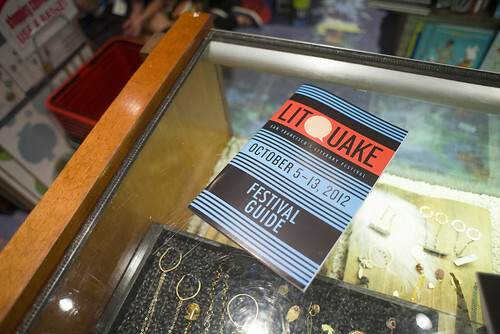 Thanks to Litquake, all of our teachers and students, and photographer Cole Anetsberger!